A train delay during rush hour is not what passengers expect, but this one time, no one wanted to hurry when a woman gave birth inside the train. Named Phoebe, the 6lb 13oz baby girl was born 7.30 pm in a rapid 15 minutes, on the floor of the 18:18 London Victoria to Maidstone East service on Wednesday. Her father 21 year-old Alan Stanley said he’s still amazed that his daughter was born in a train. Alan was with his partner Sonia Banks, 22 on the train along with his mom Mari-Anne Stanley. Sonia’s water had broken at home at around 1 pm and an hour earlier the two had gone to the hospital. But she was asked to go home saying the baby was not going to arrive for a long time. Recalls Mari-Anne, ‘Sonia’s waters broke at home at 1.12pm yesterday so I had gone with her to Pembury Hospital. We’ve got a bit of an issue with the hospital now because they obviously didn’t do a very good job with her. They did some very basic checks on her, they didn’t do a proper internal examination. They said ‘go home because you’re not going to give birth for a long while yet’. They were returning to their home in Cuxton, Kent when the baby girl decided to prove the hospital wrong. ‘Less than an hour later her baby was born on the dirty floor of a train. It certainly wasn’t what we were expecting to happen. My head is still spinning from the shock of it all. 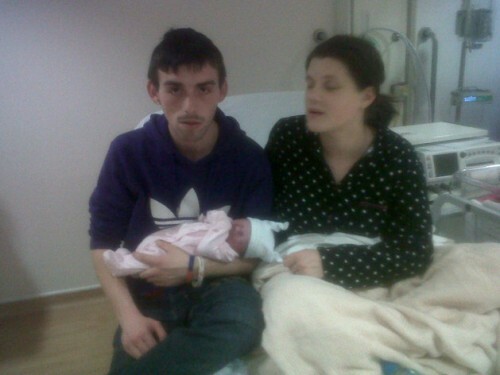 She was only in labour on the train for about 15 minutes when the baby was born. I reckon she only had three contractions in the whole labour. Passengers were a little angry and upset when the train stopped but their irritation soon turned to surprise and enthusiasm when they learned about the baby’s arrival. ‘All of the other passengers on the same carriage as us were asked to move into another carriage. It was about 7.15pm when it all started,” says Mari-Anne. “I was the person who got off the train at West Malling station and ran to the front to tell the driver not to go any further. I told him, “my daughter-in-law is having a baby on the train”. The grandmother says she asked the driver to get an ambulance. The carriage was emptied to give Phoebe and her mother some privacy. Thankfully there was a midwife riding the train. And when the little girl arrived, she was greeted with cheering and clapping from co-passengers. Sonia and Allan are not married and each has a child of their own. Phoebe’s uncle announced on twitter how she was born on a train and is fine. He was elated to have become an uncle for the second time in such an adventurous manner. Once the alarm was raised, the train’s guard called for a doctor and a nurse and the off-duty midwife came to help. 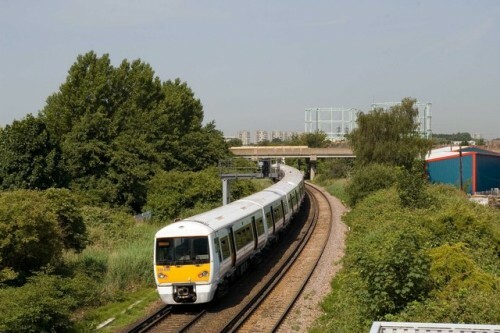 A spokesperson for the Southeastern trains says they do not know the name of the Good Samaritan. ‘The baby is doing okay and has been named Phoebe,’ he said. An ambulance was called and mother and baby were taken to hospital, and are doing well. Commuters who had been part of this special train journey, stormed twitter with their congratulatory messages.